The season six Top Chef contender—who famously faced off with his brother Michael on the season finale—executes ambitious, highly seasonal fare inside his flagship restaurant Volt in Frederick, Maryland. But Voltaggio’s entry into the professional kitchen was much more humble than that—he started out at a Maryland Holiday Inn. After graduating from the Culinary Institute of America, Voltaggio spent a decade working with star chef Charlie Palmer, in New York and Washington, DC. Then, just a few months after opening Volt, he joined his brother Michael to compete on Top Chef. He was runner-up, but the star turn created opportunities for Voltaggio, who spun the newfound notoriety into a successful collection of restaurants: Lunchbox serves noontime soups, salads and sandwiches in downtown Fredrick, while Family Meal offers family-friendly dining in a former car dealership, and Range is a 14,000-square-foot showpiece restaurant in Washington, DC. 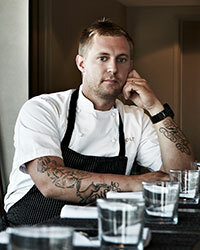 Voltaggio sat down with Food & Wine to discuss Duke’s mayonnaise, Old Bay pasta and why insects are the next big thing. My ravioli probably means the most to the restaurant; it showcases my commitment to building relationships with local producers. When I was opening Volt I started going around to meet all of these different farmers. I found out about a creamery called Cherry Glen Farm. We’ve used their products from day one, but one day I asked if I could get some of the vegetable ash they use to coat and protect one of their cheeses. I made a pasta dough with it, so the interior of the ravioli is the creamy, fresh cheese and it’s encased by this ash-flavored pasta. The dish is a playful way of visually re-creating their style of cheese. The fried chicken at Family Meal would be the second one. We soak our chicken for 12 hours in a pickle juice and roasted chicken brine, cook it in a pressure fryer and serve it in a chicken-shaped porcelain bowl. We got the timing down to a science—a batch of chicken takes 12 minutes to cook, so we actually created the recipe for the accompanying biscuits to line up with that. The chicken goes into the fryer, the biscuits go into the oven and they both come out the same exact time. I think people are afraid to actually brown or roast something in a pan. They’re afraid of fire, afraid of smoke, they’re afraid of smells in their kitchen and grease splatter. If you’re going to cook, you’ve got to be willing to get a little bit messy. Properly searing and cooking a piece of meat, fish or even a vegetable in a pan is one step that everybody misses. I would say vinegar and citrus. I might even say powdered citric acid. It helps round out flavors and brighten them up—it adds the acidity without the flavor of the lemon. I was recently introduced to Duke’s, which is the best mayonnaise on the planet. You would think that chefs who play at our level make everything from scratch, but if there’s a good product that’s out there then why not use it? Another one would be this barrel-aged fish sauce from BLiS. It’s great used in a vinaigrette or to finish off a butter sauce. Subtle amounts of it are delicious with fried, crispy vegetables, baked potatoes or brussels sprouts. Insects have already been introduced. I’ve experienced that personally when I went to René Redzepi’s MAD symposium in Copenhagen. We saw bee larvae, worms and crickets used to create fermented sauces. That’s interesting to me, and I’ll try anything. I ate live ants at Noma and they tasted like lemongrass. I think it’d be as simple as sharing a burger and a shake. I’d be excited to just have the opportunity to talk about our experiences and maybe share some ideas. I’d just want to take advantage of the time, rather than focus on the food. Right now I think it’s pasta. I was only introduced to extruders in the past few years and now I have them in two of my restaurants. I’m making an Old Bay pasta as a part of a macaroni and cheese, a pumpernickel pasta to go with lamb stock, and a beer-flavored radiatore for a beef cheek Stroganoff. Pasta is also one of those things that I can cook with my family at home and have a lot of fun with it. Olives, pickles and cured meats. I should probably say apples and oranges, but it’s just not true.